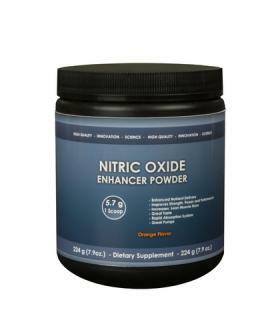 Nitric oxide (NO) naturally occurs in the body and plays a key role in vascular health. According to the National Institutes of Health, NO is a cell signaling molecule that is synthesized from L-arginine, a naturally occurring amino acid found in spinach, chicken, shellfish, nuts, seeds and some grains. It acts as a messenger between cells to help dilate blood vessels and increase blood flow. Using inhaled nitric oxide in infants after congenital heart surgery was shown to decrease the risk of pulmonary hypertensive crisis. Studies show a clear connection between NO levels and cardiac function but researchers admit much more study is needed to definitively determine if NO can prevent or treat heart disease or congestive heart failure. According to an abstract published by the American Heart Association, NO activity is deficient in people with coronary artery spasm (angina). As a result, it's believed L-arginine may help improve the symptoms of angina or chest pain. NO appears to play a primary role in maintaining erection. A PubMed abstract determined high doses of L-arginine caused improvement in men with erectile dysfunction who also had reduced urine nitrate production. L-arginine was found to reverse the antinatriuretic effect of cyclosporine in kidney transplant patients. In addition, studies showed people with kidney disease to have reduced NO production. As a result, the possibility of using L-arginine supplementation to help treat kidney disease is being explored and studied further. A Body Builder's Best Friend or Hype? NO supplements are used by many body builders and fitness enthusiasts (men and women) to build muscle, increase strength and improve recovery time. Since NO increases blood flow to muscles, it's believed taking NO supplements can help increase muscle mass. However, a study on eight healthy men concluded that arginine supplementation does not increase NO synthesis in the body or increase blood flow to muscles. Evidence supporting NO supplements as a means to increase muscle mass is mostly anecdotal. However, many body builders and athletes continue to use them and tout their success. More research is needed to definitively prove or disprove their efficacy. If you have any of the above conditions or take any of the above medications, it's critical that you consult your doctor before using NO supplements to avoid potentially dangerous side effects or interactions. Studies clearly show that nitric oxide is critical to cardiovascular health, erectile function and other physiological functions. NO supplementation is proven to be a viable treatment for some health conditions and shows potential in treating others. However, much more study is needed to determine if the benefits outweigh the risks. NO supplements can interact with many common drugs and make many common health problems worse. If you're trying to decide whether or not nitric oxide supplements can help you, it's very important to discuss the pros and cons with your doctor.